SAINT is a novel about sensing something more in the stories that shaped our lives. Each of us has moments of doubt. Not all of us do something about it. Doubt is disruptive, after all. Yet doubt can also motivate and lead us to discovery. Accomplished research biochemist Dr. Andrew Shepard discovers that memory and consciousness do not die when when our body breathes its last. These ephemeral qualities of our existence live on, if only they can be resurrected in the mind and body of another carefully matched individual. Dr. Shepard has created such a process. Now, a brilliant Vatican liaison, the pope, an ambitious cardinal, a dedicated Swiss Guard, and an unsuspecting ancient firebrand are about to experience the effects of memory resurrection first-hand. And it will change everything. An experiment 2,000 years in the making. When Dr. Andrew Shepard revives human memory from DNA in an ancient relic, he ignites a heart-stopping global crisis. Can history's artifacts reveal truths lost in the mists of time? For the world’s political and spiritual leaders, memory resurrection is a catastrophe. For humankind, this changes everything. For you, this opens a door to exploring your own secrets and mysteries. Experience Your Decisive Moment - What Will You Do? Peter escapes from the BioGenera lab in a desperate attempt to return to Rome and to confront the Pontiff, while being stalked by a mysterious assassin intent on silencing him once and for all. Ultimately, he must decide whether to stay in the present or return to his mysterious other existence. Through it all, Andrew Shepard and Vatican liaison Giuliana Sabatini discover within themselves the surprising answer to the bittersweet choice only they can make. Many passages I had to read over just because of the deliciousness of the words. ...Saint is a charmer. Excellent read. Saint is that rare thriller that gives a shot of adrenaline to the brain as well as the heart. The sheer velocity of the story keeps you turning the pages while the book's reflections on science, orthodoxy and the meaning of faith make you pause. Saint is a must read for those who enjoy traveling through time and across continents, and rethinking not only their own assumptions but the course of history. I read it in 1997 and still remember it. I wish someone could make this a movie. Fast and interesting read. ***** This book may actually surpass DaVinci Code on my list of favorite novels. I probably give 10% of the books I read 5 stars - this is one of those books. It is both thought-provoking and fascinating. While using RCC as a plot device is certainly nothing new, Bailey makes use of it like few authors I've read. Bailey poses the question of what would happen if we could actually talk, face to face, to a contemporary of Jesus, instead of relying on the Bible. How would we react if we learned that the Bible was written with literary license instead of what actually happened? Bailey tries to answer this with "Saint." The characterizations in this book were wonderfully crafted and the story moved along quite smoothly. I don't normally insist that my father read any of the books that I am reading, but I insisted that he read this one. And when I asked for the copy to be returned to me, he had loaned it to someone else! This book should have been a New York Times Best Seller. As far as I know it did not make that list. But the plot is great, the biotechnology is great, and the plot twists at the end are excellent. Thank you, Mark, for writing this book. Please write again! Join my email list for occasional updates. Your email is never shared and you may unsubscribe at any time. 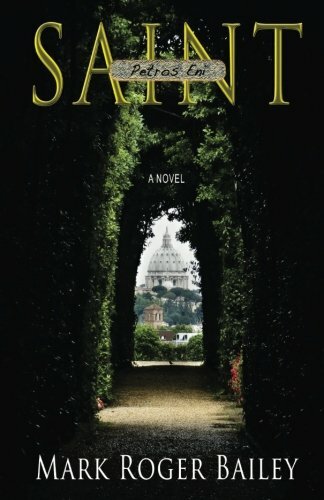 Thank you for signing up for occasional email updates about Mark Roger Bailey's novel SAINT, other books and projects. We will never share your email information with anyone and you may unsubscribe at any time. Thank you for your email! I will respond, as appropriate, soon. The “he” in question is St. Peter. The book asks us to believe that a bio-genetic researcher in California has made a breakthrough in “memory resurrection.” By concentrating and injecting DNA from one subject into another, Dr. Andrew Shepard has managed to transfer the consciousness of the DNA donor into the recipient. Eventually, he obtains a strand of DNA from the bones of St. Peter and succeeds in “resurrecting” Peter’s personality and memories in the body of a Portuguese fisherman, Nicolao Soares. I am no bio-geneticist, so I can’t really say how plausible the science is. I am, of course, interested in faith, spirituality, morality, and theology; and the novel poses some interesting questions in those areas. (Is the researcher “playing God”? What happens to the personality and memories of the fisherman “host”?) Dr. Shepard happens to be an ex-Catholic; “science is his religion, the search for truth in the maze of genetics his mission.” We gradually learn that the death of his six-year old daughter from a brain aneurysm has destroyed his marriage, along with what was left of his faith. Thus, he wrestles with the age-old problem of theodicy: if God is all-good and all-powerful, then why do horrendous things sometimes happen to good and innocent people? Even more interesting is the “what if” aspect. “What if” we actually had St. Peter here in the present-day world and Church? What questions might he answer for us about Jesus – what He really was like, what He really said and believed, and so on? And if Peter’s testimony conflicted with the inherited tradition, would it be welcome? There is much wisdom in “Peter’s” reflections, I think. In fact, having been programmed by the media, we almost certainly have far greater expectations of instant gratification and easy answers than did Peter’s contemporaries in 1st- century Palestine. What remains constant, however, is the desire – a longing for purpose, for meaning, for direction. And what also remains constant is that real answers, answers that actually “work,” are never quick, easy, or black-and-white. Real answers are found in and through relationships, over time. And real answers always remain partially shrouded in unfathomable mystery. Near the end of the novel, when he finally succeeds in having a face-to-face conversation with his successor, the present-day pope, Peter offers an even more challenging observation. “I see too many believers using their faith as an excuse. They choose their Christ or Yahweh or Buddha or Allah or whatever name they call God by, figure they’ve found the answer, and stop questioning, stop their search for truth.” He suggests instead that “finding” and even naming God – that is, affiliating with and studying a religious tradition – should be just a beginning. And he argues that the Church’s mission should be to learn, as much as to teach. He sums up: “You have the power to make each moment count. Live each hour consciously, gratefully, generously. Give something to every person and every creature you meet…. Look them in the eye and feel their concerns for a moment; give to them your undivided attention. Better yet, share the humility of your own spirit…. Understanding grows from humility of spirit, from learning, not from the conceit of knowledge. Give that which you most desire to another person.” In other words, live by the “Golden Rule,” some version of which exists in almost every major religious and philosophical tradition. Jesus said it this way in the Sermon on the Mount: “Do to others whatever you would have them do to you. This is the law and the prophets” (Matthew 7:12). Simple? Yes. Easy? Never. Mark Roger Bailey is an Emmy award-winning creative writer and the author of two novels, SAINT and BEYOND THESE WOODS. His force of thought on the paradoxical interplay between science, religion, government and human belief systems propels stories that cross from literary to thriller and back. Compelling, believable, expert and cinematic describe his writing. He lives life forward most of the time. He and his wife live in California. Mark is currently at work on a new novel. Be the first to learn about SAINT News . . .